1 A None No Power Seat 1 A is a standard First Class seat located at a bulkhead which transforms into a fully flat bed. There may be no floor storage during takeoff and landing. 1 B None No Power Seat 1 B is a standard First Class seat located at a bulkhead which transforms into a fully flat bed. The proximity to the galley and lavatory may be bothersome. There may be no floor storage during takeoff and landing. 1 C None No Power Seat 1 C is a standard First Class seat located at a bulkhead which transforms into a fully flat bed. The proximity to the galley and lavatory may be bothersome. There may be no floor storage during takeoff and landing. 1 G None No Power Seat 1 G is a standard First Class seat located at a bulkhead which transforms into a fully flat bed. The proximity to the galley and lavatory may be bothersome. There may be no floor storage during takeoff and landing. 1 H None No Power Seat 1 H is a standard First Class seat located at a bulkhead which transforms into a fully flat bed. The proximity to the galley and lavatory may be bothersome. There may be no floor storage during takeoff and landing. 1 J None No Power Seat 1 J is a standard First Class seat located at a bulkhead which transforms into a fully flat bed. There may be no floor storage during takeoff and landing. 11 A None No Power Seat 11 A is an Economy Class seat designated by Hawaiian Airlines as an Extra Comfort seat with extra seat pitch, however, the proximity to the galley and lavatory area may be bothersome. Hawaiian Airlines charges an extra fee to reserve these seats. This seat has extra legroom due to the lack of Bulkhead between Business and Economy. The tray table is in the armrest, making the armrest immovable and slightly reducing seat width. There is no floor storage for this seat during takeoff and landing. Passengers seated in this first Economy Class section will experience a quieter flight and this cabin area will feel more private, with only two rows. Also, you will be among the first passengers to be served. 11 B None No Power Seat 11 B is an Economy Class seat designated by Hawaiian Airlines as an Extra Comfort seat with extra seat pitch, however, the proximity to the galley and lavatory area may be bothersome. Hawaiian Airlines charges an extra fee to reserve these seats. This seat has extra legroom due to the lack of Bulkhead between Business and Economy. The tray table is in the armrest, making the armrest immovable and slightly reducing seat width. There is no floor storage for this seat during takeoff and landing. Passengers seated in this first Economy Class section will experience a quieter flight and this cabin area will feel more private, with only two rows. Also, you will be among the first passengers to be served. 11 C None No Power Seat 11 C is an Economy Class seat designated by Hawaiian Airlines as an Extra Comfort seat with extra seat pitch and additional legroom. The tray table is in the armrest, making the armrest immovable and slightly reducing seat width. There is no floor storage for this seat during takeoff and landing. 11 D None No Power Seat 11 D is an Economy Class seat designated by Hawaiian Airlines as an Extra Comfort seat with extra seat pitch and additional legroom. The tray table is in the armrest, making the armrest immovable and slightly reducing seat width. There is no floor storage for this seat during takeoff and landing. 11 E None No Power Seat 11 E is an Economy Class seat designated by Hawaiian Airlines as an Extra Comfort seat with extra seat pitch and additional legroom. The tray table is in the armrest, making the armrest immovable and slightly reducing seat width. There is no floor storage for this seat during takeoff and landing. 11 G None No Power Seat 11 G is an Economy Class seat designated by Hawaiian Airlines as an Extra Comfort seat with extra seat pitch and additional legroom. The tray table is in the armrest, making the armrest immovable and slightly reducing seat width. There is no floor storage for this seat during takeoff and landing. 11 H None No Power Seat 11 H is an Economy Class seat designated by Hawaiian Airlines as an Extra Comfort seat with extra seat pitch, however, the proximity to the galley and lavatory area may be bothersome. Hawaiian Airlines charges an extra fee to reserve these seats. This seat has extra legroom due to the lack of Bulkhead between Business and Economy. The tray table is in the armrest, making the armrest immovable and slightly reducing seat width. There is no floor storage for this seat during takeoff and landing. Passengers seated in this first Economy Class section will experience a quieter flight and this cabin area will feel more private, with only two rows. Also, you will be among the first passengers to be served. 11 J None No Power Seat 11 J is an Economy Class seat designated by Hawaiian Airlines as an Extra Comfort seat with extra seat pitch, however, the proximity to the galley and lavatory area may be bothersome. Hawaiian Airlines charges an extra fee to reserve these seats. This seat has extra legroom due to the lack of Bulkhead between Business and Economy. The tray table is in the armrest, making the armrest immovable and slightly reducing seat width. There is no floor storage for this seat during takeoff and landing. Passengers seated in this first Economy Class section will experience a quieter flight and this cabin area will feel more private, with only two rows. Also, you will be among the first passengers to be served. 12 C None No Power Seat 12 C is an Economy Class seat designated by Hawaiian Airlines as an Extra Comfort seat with extra seat pitch, however, the proximity to the galley and lavatory area may be bothersome. 12 D None No Power Seat 12 D is an Economy Class seat designated by Hawaiian Airlines as an Extra Comfort seat with extra seat pitch, however, the proximity to the galley and lavatory area may be bothersome. 12 E None No Power Seat 12 E is an Economy Class seat designated by Hawaiian Airlines as an Extra Comfort seat with extra seat pitch, however, the proximity to the galley and lavatory area may be bothersome. 12 G None No Power Seat 12 G is an Economy Class seat designated by Hawaiian Airlines as an Extra Comfort seat with extra seat pitch, however, the proximity to the galley and lavatory area may be bothersome. 14 A None No Power Seat 14 A is an Economy Class seat designated by Hawaiian Airlines as an Extra Comfort seat with extra seat pitch, however, the proximity to the lavatory and galley may be bothersome. Hawaiian Airlines charges an extra fee to reserve this seat. This seat has additional legroom due to the location of the bulkhead. The tray table is in the armrest, making the armrest immovable and slightly reducing seat width. There is no floor storage for this seat during takeoff and landing. A bassinet is available at this location, therefore, a passenger traveling with an infant might be seated here. Passengers seated in this Economy Class section will be among the first passengers to be served. 14 B None No Power Seat 14 B is an Economy Class seat designated by Hawaiian Airlines as an Extra Comfort seat with extra seat pitch, however, the proximity to the lavatory and galley may be bothersome. Hawaiian Airlines charges an extra fee to reserve this seat. This seat has additional legroom due to the location of the bulkhead. The tray table is in the armrest, making the armrest immovable and slightly reducing seat width. There is no floor storage for this seat during takeoff and landing. A bassinet is available at this location, therefore, a passenger traveling with an infant might be seated here. Passengers seated in this Economy Class section will be among the first passengers to be served. 14 C None No Power Seat 14 C is an Economy Class seat designated by Hawaiian Airlines as an Extra Comfort seat with extra seat pitch, however, the proximity to the lavatory and galley may be bothersome. Hawaiian Airlines charges an extra fee to reserve this seat. This seat has additional legroom due to the location of the bulkhead. The tray table is in the armrest, making the armrest immovable and slightly reducing seat width. There is no floor storage for this seat during takeoff and landing. A bassinet is available at this location, therefore, a passenger traveling with an infant might be seated here. Passengers seated in this Economy Class section will be among the first passengers to be served. 14 D None No Power Seat 14 D is an Economy Class seat designated by Hawaiian Airlines as an Extra Comfort seat with extra seat pitch, however, the proximity to the lavatory and galley may be bothersome. Hawaiian Airlines charges an extra fee to reserve this seat. This seat has additional legroom due to the location of the bulkhead. The tray table is in the armrest, making the armrest immovable and slightly reducing seat width. There is no floor storage for this seat during takeoff and landing. A bassinet is available at this location, therefore, a passenger traveling with an infant might be seated here. Passengers seated in this Economy Class section will be among the first passengers to be served. 14 E None No Power Seat 14 E is an Economy Class seat designated by Hawaiian Airlines as an Extra Comfort seat with extra seat pitch, however, the proximity to the lavatory and galley may be bothersome. Hawaiian Airlines charges an extra fee to reserve this seat. This seat has additional legroom due to the location of the bulkhead. The tray table is in the armrest, making the armrest immovable and slightly reducing seat width. There is no floor storage for this seat during takeoff and landing. A bassinet is available at this location, therefore, a passenger traveling with an infant might be seated here. Passengers seated in this Economy Class section will be among the first passengers to be served. 14 G None No Power Seat 14 G is an Economy Class seat designated by Hawaiian Airlines as an Extra Comfort seat with extra seat pitch, however, the proximity to the lavatory and galley may be bothersome. Hawaiian Airlines charges an extra fee to reserve this seat. This seat has additional legroom due to the location of the bulkhead. The tray table is in the armrest, making the armrest immovable and slightly reducing seat width. There is no floor storage for this seat during takeoff and landing. A bassinet is available at this location, therefore, a passenger traveling with an infant might be seated here. Passengers seated in this Economy Class section will be among the first passengers to be served. 14 H None No Power Seat 14 H is an Economy Class seat designated by Hawaiian Airlines as an Extra Comfort seat with extra seat pitch, however, the proximity to the lavatory and galley may be bothersome. Hawaiian Airlines charges an extra fee to reserve this seat. This seat has additional legroom due to the location of the bulkhead. The tray table is in the armrest, making the armrest immovable and slightly reducing seat width. There is no floor storage for this seat during takeoff and landing. A bassinet is available at this location, therefore, a passenger traveling with an infant might be seated here. Passengers seated in this Economy Class section will be among the first passengers to be served. 14 J None No Power Seat 14 J is an Economy Class seat designated by Hawaiian Airlines as an Extra Comfort seat with extra seat pitch, however, the proximity to the lavatory and galley may be bothersome. Hawaiian Airlines charges an extra fee to reserve this seat. This seat has additional legroom due to the location of the bulkhead. The tray table is in the armrest, making the armrest immovable and slightly reducing seat width. There is no floor storage for this seat during takeoff and landing. A bassinet is available at this location, therefore, a passenger traveling with an infant might be seated here. Passengers seated in this Economy Class section will be among the first passengers to be served. 15 A None No Power Seat 15 A is an Economy Class seat designated by Hawaiian Airlines as an Extra Comfort seat with extra seat pitch. Hawaiian Airlines charges an extra fee to reserve these seats. Passengers seated in this Economy Class section will be among the first passengers to be served. 15 B None No Power Seat 15 B is an Economy Class seat designated by Hawaiian Airlines as an Extra Comfort seat with extra seat pitch. Hawaiian Airlines charges an extra fee to reserve these seats. Passengers seated in this Economy Class section will be among the first passengers to be served. 15 C None No Power Seat 15 C is an Economy Class seat designated by Hawaiian Airlines as an Extra Comfort seat with extra seat pitch. Hawaiian Airlines charges an extra fee to reserve these seats. Passengers seated in this Economy Class section will be among the first passengers to be served. 15 D None No Power Seat 15 D is an Economy Class seat designated by Hawaiian Airlines as an Extra Comfort seat with extra seat pitch. Hawaiian Airlines charges an extra fee to reserve these seats. Passengers seated in this Economy Class section will be among the first passengers to be served. 15 E None No Power Seat 15 E is an Economy Class seat designated by Hawaiian Airlines as an Extra Comfort seat with extra seat pitch. Hawaiian Airlines charges an extra fee to reserve these seats. Passengers seated in this Economy Class section will be among the first passengers to be served. 15 G None No Power Seat 15 G is an Economy Class seat designated by Hawaiian Airlines as an Extra Comfort seat with extra seat pitch. Hawaiian Airlines charges an extra fee to reserve these seats. Passengers seated in this Economy Class section will be among the first passengers to be served. 15 H None No Power Seat 15 H is an Economy Class seat designated by Hawaiian Airlines as an Extra Comfort seat with extra seat pitch. Hawaiian Airlines charges an extra fee to reserve these seats. Passengers seated in this Economy Class section will be among the first passengers to be served. 15 J None No Power Seat 15 J is an Economy Class seat designated by Hawaiian Airlines as an Extra Comfort seat with extra seat pitch. Hawaiian Airlines charges an extra fee to reserve these seats. Passengers seated in this Economy Class section will be among the first passengers to be served. 16 A None No Power Seat 16 A is an Economy Class seat designated by Hawaiian Airlines as an Extra Comfort seat with extra seat pitch. Hawaiian Airlines charges an extra fee to reserve these seats. Passengers seated in this Economy Class section will be among the first passengers to be served. 16 B None No Power Seat 16 B is an Economy Class seat designated by Hawaiian Airlines as an Extra Comfort seat with extra seat pitch. Hawaiian Airlines charges an extra fee to reserve these seats. Passengers seated in this Economy Class section will be among the first passengers to be served. 16 C None No Power Seat 16 C is an Economy Class seat designated by Hawaiian Airlines as an Extra Comfort seat with extra seat pitch. Hawaiian Airlines charges an extra fee to reserve these seats. Passengers seated in this Economy Class section will be among the first passengers to be served. 16 D None No Power Seat 16 D is an Economy Class seat designated by Hawaiian Airlines as an Extra Comfort seat with extra seat pitch. Hawaiian Airlines charges an extra fee to reserve these seats. Passengers seated in this Economy Class section will be among the first passengers to be served. 16 E None No Power Seat 16 E is an Economy Class seat designated by Hawaiian Airlines as an Extra Comfort seat with extra seat pitch. Hawaiian Airlines charges an extra fee to reserve these seats. Passengers seated in this Economy Class section will be among the first passengers to be served. 16 G None No Power Seat 16 G is an Economy Class seat designated by Hawaiian Airlines as an Extra Comfort seat with extra seat pitch. Hawaiian Airlines charges an extra fee to reserve these seats. Passengers seated in this Economy Class section will be among the first passengers to be served. 16 H None No Power Seat 16 H is an Economy Class seat designated by Hawaiian Airlines as an Extra Comfort seat with extra seat pitch. Hawaiian Airlines charges an extra fee to reserve these seats. Passengers seated in this Economy Class section will be among the first passengers to be served. 16 J None No Power Seat 16 J is an Economy Class seat designated by Hawaiian Airlines as an Extra Comfort seat with extra seat pitch. Hawaiian Airlines charges an extra fee to reserve these seats. Passengers seated in this Economy Class section will be among the first passengers to be served. 17 A None No Power Seat 17 A is an Economy Class seat designated by Hawaiian Airlines as an Extra Comfort seat with extra seat pitch. Hawaiian Airlines charges an extra fee to reserve these seats. Passengers seated in this Economy Class section will be among the first passengers to be served. 17 B None No Power Seat 17 B is an Economy Class seat designated by Hawaiian Airlines as an Extra Comfort seat with extra seat pitch. Hawaiian Airlines charges an extra fee to reserve these seats. Passengers seated in this Economy Class section will be among the first passengers to be served. 17 C None No Power Seat 17 C is an Economy Class seat designated by Hawaiian Airlines as an Extra Comfort seat with extra seat pitch. Hawaiian Airlines charges an extra fee to reserve these seats. Passengers seated in this Economy Class section will be among the first passengers to be served. 17 D None No Power Seat 17 D is an Economy Class seat designated by Hawaiian Airlines as an Extra Comfort seat with extra seat pitch. Hawaiian Airlines charges an extra fee to reserve these seats. Passengers seated in this Economy Class section will be among the first passengers to be served. 17 E None No Power Seat 17 E is an Economy Class seat designated by Hawaiian Airlines as an Extra Comfort seat with extra seat pitch. Hawaiian Airlines charges an extra fee to reserve these seats. Passengers seated in this Economy Class section will be among the first passengers to be served. 17 G None No Power Seat 17 G is an Economy Class seat designated by Hawaiian Airlines as an Extra Comfort seat with extra seat pitch. Hawaiian Airlines charges an extra fee to reserve these seats. Passengers seated in this Economy Class section will be among the first passengers to be served. 17 H None No Power Seat 17 H is an Economy Class seat designated by Hawaiian Airlines as an Extra Comfort seat with extra seat pitch. Hawaiian Airlines charges an extra fee to reserve these seats. Passengers seated in this Economy Class section will be among the first passengers to be served. 17 J None No Power Seat 17 J is an Economy Class seat designated by Hawaiian Airlines as an Extra Comfort seat with extra seat pitch. Hawaiian Airlines charges an extra fee to reserve these seats. Passengers seated in this Economy Class section will be among the first passengers to be served. 18 A None No Power Seat 18 A is an Economy Class seat designated by Hawaiian Airlines as an Extra Comfort seat with extra seat pitch. Hawaiian Airlines charges an extra fee to reserve these seats. Passengers seated in this Economy Class section will be among the first passengers to be served. 18 B None No Power Seat 18 B is an Economy Class seat designated by Hawaiian Airlines as an Extra Comfort seat with extra seat pitch. Hawaiian Airlines charges an extra fee to reserve these seats. Passengers seated in this Economy Class section will be among the first passengers to be served. 18 H None No Power Seat 18 H is an Economy Class seat designated by Hawaiian Airlines as an Extra Comfort seat with extra seat pitch. Hawaiian Airlines charges an extra fee to reserve these seats. Passengers seated in this Economy Class section will be among the first passengers to be served. 18 J None No Power Seat 18 J is an Economy Class seat designated by Hawaiian Airlines as an Extra Comfort seat with extra seat pitch. Hawaiian Airlines charges an extra fee to reserve these seats. Passengers seated in this Economy Class section will be among the first passengers to be served. 19 A None No Power Seat 19 A is an Economy Class seat designated by Hawaiian Airlines as an Extra Comfort seat with extra seat pitch. Hawaiian Airlines charges an extra fee to reserve these seats. Passengers seated in this Economy Class section will be among the first passengers to be served. 19 B None No Power Seat 19 B is an Economy Class seat designated by Hawaiian Airlines as an Extra Comfort seat with extra seat pitch. Hawaiian Airlines charges an extra fee to reserve these seats. Passengers seated in this Economy Class section will be among the first passengers to be served. 19 H None No Power Seat 19 H is an Economy Class seat designated by Hawaiian Airlines as an Extra Comfort seat with extra seat pitch. Hawaiian Airlines charges an extra fee to reserve these seats. Passengers seated in this Economy Class section will be among the first passengers to be served. 19 J None No Power Seat 19 J is an Economy Class seat designated by Hawaiian Airlines as an Extra Comfort seat with extra seat pitch. Hawaiian Airlines charges an extra fee to reserve these seats. Passengers seated in this Economy Class section will be among the first passengers to be served. 2 A None No Power Seat 2 A is a standard First Class seat which transforms into a fully flat bed. 2 B None No Power Seat 2 B is a standard First Class seat which transforms into a fully flat bed. 2 C None No Power Seat 2 C is a standard First Class seat which transforms into a fully flat bed. 2 G None No Power Seat 2 G is a standard First Class seat which transforms into a fully flat bed. 2 H None No Power Seat 2 H is a standard First Class seat which transforms into a fully flat bed. 2 J None No Power Seat 2 J is a standard First Class seat which transforms into a fully flat bed. 20 A None No Power Seat 20 A is an Economy Class seat designated by Hawaiian Airlines as an Extra Comfort seat with extra seat pitch. Hawaiian Airlines charges an extra fee to reserve these seats. Passengers seated in this Economy Class section will be among the first passengers to be served. 20 B None No Power Seat 20 B is an Economy Class seat designated by Hawaiian Airlines as an Extra Comfort seat with extra seat pitch. Hawaiian Airlines charges an extra fee to reserve these seats. Passengers seated in this Economy Class section will be among the first passengers to be served. 20 H None No Power Seat 20 H is an Economy Class seat designated by Hawaiian Airlines as an Extra Comfort seat with extra seat pitch. Hawaiian Airlines charges an extra fee to reserve these seats. Passengers seated in this Economy Class section will be among the first passengers to be served. 20 J None No Power Seat 20 J is an Economy Class seat designated by Hawaiian Airlines as an Extra Comfort seat with extra seat pitch. Hawaiian Airlines charges an extra fee to reserve these seats. Passengers seated in this Economy Class section will be among the first passengers to be served. 21 A None No Power Seat 21 A is an Economy Class seat designated by Hawaiian Airlines as an Extra Comfort seat with extra seat pitch. Hawaiian Airlines charges an extra fee to reserve these seats. Passengers seated in this Economy Class section will be among the first passengers to be served. 21 B None No Power Seat 21 B is an Economy Class seat designated by Hawaiian Airlines as an Extra Comfort seat with extra seat pitch. Hawaiian Airlines charges an extra fee to reserve these seats. Passengers seated in this Economy Class section will be among the first passengers to be served. 21 H None No Power Seat 21 H is an Economy Class seat designated by Hawaiian Airlines as an Extra Comfort seat with extra seat pitch. Hawaiian Airlines charges an extra fee to reserve these seats. Passengers seated in this Economy Class section will be among the first passengers to be served. 21 J None No Power Seat 21 J is an Economy Class seat designated by Hawaiian Airlines as an Extra Comfort seat with extra seat pitch. Hawaiian Airlines charges an extra fee to reserve these seats. Passengers seated in this Economy Class section will be among the first passengers to be served. 3 A None No Power Seat 3 A is a standard First Class seat which transforms into a fully flat bed. 3 B None No Power Seat 3 B is a standard First Class seat which transforms into a fully flat bed. 3 C None No Power Seat 3 C is a standard First Class seat which transforms into a fully flat bed. 3 G None No Power Seat 3 G is a standard First Class seat which transforms into a fully flat bed. 3 H None No Power Seat 3 H is a standard First Class seat which transforms into a fully flat bed. 3 J None No Power Seat 3 J is a standard First Class seat which transforms into a fully flat bed. 30 A None No Power Seat 30 A is a standard Economy Class seat whose proximity to the lavatory may be bothersome. 30 B None No Power Seat 30 B is a standard Economy Class seat whose proximity to the lavatory may be bothersome. 30 C None No Power Seat 30 C is a standard Economy Class seat whose proximity to the lavatory may be bothersome. 30 G None No Power Seat 30 G is a standard Economy Class seat whose proximity to the lavatory may be bothersome. 30 H None No Power Seat 30 H is a standard Economy Class seat whose proximity to the lavatory may be bothersome. 30 J None No Power Seat 30 J is a standard Economy Class seat whose proximity to the lavatory may be bothersome. 31 C None No Power Seat 31 C is a standard Economy Class seat whose proximity to the lavatory may be bothersome. 31 D None No Power Seat 31 D is a standard Economy Class seat whose proximity to the lavatory may be bothersome. 31 E None No Power Seat 31 E is a standard Economy Class seat whose proximity to the lavatory may be bothersome. 31 G None No Power Seat 31 G is a standard Economy Class seat whose proximity to the lavatory may be bothersome. 33 C None No Power Seat 33 C is an Economy Class seat designated by Hawaiian Airlines as an Extra Comfort seat with extra seat pitch, however, the proximity to the lavatory may be bothersome. Hawaiian Airlines charges an extra fee to reserve these seats. The tray table is in the armrest, making the armrest immovable and slightly reducing seat width. There is no floor storage for this seat during takeoff and landing. 33 D None No Power Seat 33 D is an Economy Class seat designated by Hawaiian Airlines as an Extra Comfort seat with extra seat pitch, however, the proximity to the lavatory may be bothersome. Hawaiian Airlines charges an extra fee to reserve these seats. The tray table is in the armrest, making the armrest immovable and slightly reducing seat width. There is no floor storage for this seat during takeoff and landing. 33 E None No Power Seat 33 E is an Economy Class seat designated by Hawaiian Airlines as an Extra Comfort seat with extra seat pitch, however, the proximity to the lavatory may be bothersome. Hawaiian Airlines charges an extra fee to reserve these seats. The tray table is in the armrest, making the armrest immovable and slightly reducing seat width. There is no floor storage for this seat during takeoff and landing. 33 G None No Power Seat 33 G is an Economy Class seat designated by Hawaiian Airlines as an Extra Comfort seat with extra seat pitch, however, the proximity to the lavatory may be bothersome. Hawaiian Airlines charges an extra fee to reserve these seats. The tray table is in the armrest, making the armrest immovable and slightly reducing seat width. There is no floor storage for this seat during takeoff and landing. 34 A None No Power Seat 34 A is an Economy Class seat designated by Hawaiian Airlines as an Extra Comfort seat with extra seat pitch. Hawaiian Airlines charges an extra fee to reserve these seats. The tray table is in the armrest, making the armrest immovable and slightly reducing seat width. There is no floor storage for this seat during takeoff and landing. 34 B None No Power Seat 34 B is an Economy Class seat designated by Hawaiian Airlines as an Extra Comfort seat with extra seat pitch. Hawaiian Airlines charges an extra fee to reserve these seats. The tray table is in the armrest, making the armrest immovable and slightly reducing seat width. There is no floor storage for this seat during takeoff and landing. 34 H None No Power Seat 34 H is an Economy Class seat designated by Hawaiian Airlines as an Extra Comfort seat with extra seat pitch. Hawaiian Airlines charges an extra fee to reserve these seats. The tray table is in the armrest, making the armrest immovable and slightly reducing seat width. There is no floor storage for this seat during takeoff and landing. 34 J None No Power Seat 34 J is an Economy Class seat designated by Hawaiian Airlines as an Extra Comfort seat with extra seat pitch. Hawaiian Airlines charges an extra fee to reserve these seats. The tray table is in the armrest, making the armrest immovable and slightly reducing seat width. There is no floor storage for this seat during takeoff and landing. 42 C None No Power Seat 42 C is a standard Economy Class seat that juts out into the aisle and is often bumped into by other passengers and crew. 42 G None No Power Seat 42 G is a standard Economy Class seat that juts out into the aisle and is often bumped into by other passengers and crew. 45 C None No Power Seat 45 C is a standard Economy Class seat whose proximity to the lavatory may be bothersome. 45 G None No Power Seat 45 G is a standard Economy Class seat whose proximity to the lavatory may be bothersome. 46 B None No Power Seat 46 B is a standard Economy Class seat whose proximity to the lavatory may be bothersome. 46 C None No Power Seat 46 C is a standard Economy Class seat located in the last row of the plane and may have limited recline. The proximity to the lavatory and galley may be bothersome. You will also be among the last passengers to deplane upon arrival. 46 G None No Power Seat 46 G is a standard Economy Class seat located in the last row of the plane and may have limited recline. The proximity to the lavatory and galley may be bothersome. You will also be among the last passengers to deplane upon arrival. 46 H None No Power Seat 46 H is a standard Economy Class seat whose proximity to the lavatory may be bothersome. 47 A None No Power Seat 47 A is a standard Economy Class seat located in the last row of the plane and may have limited recline. The proximity to the lavatory and galley may be bothersome. You will also be among the last passengers to deplane upon arrival. 47 B None No Power Seat 47 B is a standard Economy Class seat located in the last row of the plane and may have limited recline. The proximity to the lavatory and galley may be bothersome. You will also be among the last passengers to deplane upon arrival. 47 H None No Power Seat 47 H is a standard Economy Class seat located in the last row of the plane and may have limited recline. The proximity to the lavatory and galley may be bothersome. You will also be among the last passengers to deplane upon arrival. 47 J None No Power Seat 47 J is a standard Economy Class seat located in the last row of the plane and may have limited recline. The proximity to the lavatory and galley may be bothersome. You will also be among the last passengers to deplane upon arrival. Audio entertainment on this plane is available in all classes via the seatback touch screen. This new aircraft is equipped with Audio Video on Demand (AVOD) located at each seatback, in all classes. A high-resolution LCD touch screen monitor allows passengers to choose from a wide selection of programming and even connect to their own media players. Passengers sitting in First Class enjoy the added benefits of having a larger monitor and iPod compatibility. The entertainment system also features games and videos. Each system also includes a USB interface for personal media players. First Class and Extra Comfort seats feature access to full AC power ports and USB ports. Hawaiian Airlines offers complimentary airline meals or snacks on every Trans-Pacific, South Pacific, and Asia flight. The menu includes a wide array of entrees that combine fine cuisine with traditional island flavors. To check the menu for your next flight, click here and select the route on which you are flying. Child Meals may be requested through Hawaiian Airlines Reservations on International flights only, and must be placed at least 48 hours in advance of flight departure. Actual menu items in a Child Meal may vary depending on availability. Hawaiian Airlines operates the Airbus A330-200 on long-haul flights. This aircraft flies with 18 lie flat seats in First Class and 260 seats in Economy Class. The Airbus A330-200 aircraft version presented here features lie flat beds in its First Class Premium Cabin. The lie flat bed seats have been designed with aspects from Hawaii's environment such as curves, earth tone colors, and natural wood. Each of Hawaiian's A330's are named after a star or constellation used by Polynesian voyagers for celestial navigation. These seats are terrible. We've flown these exact seats a few years ago, before they installed a wall from the ceiling to the floor between first class and these seats. There is limited legroom now. If you are over 5' 10" tall you will be pressing your feet onto the wall for a long-haul flight, unable to stretch out. The seats are stiff and uncomfortable too. Don't know why they are called "Extra Comfort" seats. I just read a review of seat 11-H (&J) which had a mistake in it. These seats DO INDEED recline. It's a full-size, standard coach type recline (to about 130 degrees). You do have to engage your body to make it recline; you have to push back fairly strongly with your upper back/shoulders; that did throw me off for a moment, but it works. WHile there is some light from the galley, the seat is very comfy. I'm 6'3" & 260 lbs, NOT small. This is the most uncomfortable airline seat i have ever sat in. Before Hawaiian airlines changed to the A 330 they flew the Boing 767 on this route and it was much more comfortable. Ive flown Hawaiian every year for the last 18 years because of the comforable seats. I will loook at other airlines. I'm not sure if it was just my specific seat but I found the cushions to be slightly uncomfortable. Legroom seemed pretty tight for a seat with 31" pitch, and it only got worse if the passenger in front of you reclines. I would definitely recommend paying up for an Extra Comfort seat if you're over 6' tall. (to add to my previous negative comment). The proximity to the lavatory means every few minutes a loud banging of the lavatory door and loud talking among people gathering in that area. Very poor. 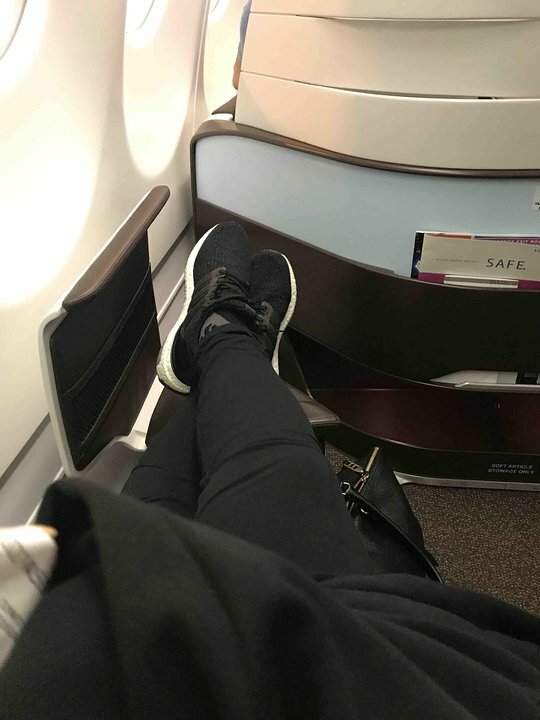 Seat is at a bend in the aisle so that your feet placed directly in front of you, as well as your arm inside of the arm rest get hit whenever people pass by. There is almost no place in front of you to place your things (which you don't have access to for takeoff or landing) -you must rely on the good will of your neighbor to let you put your things in front of them. Tray in the arm rest gives you less seat room. Excellent width and legroom, service was equally excellent as the seats. Great Seat! Tons of room! Food and service was on point! One of the few wide-body flight from the mainland to the islands. Great to plane to fly. I recommend this plane and airline anytime you can fly on them. The seat did not recline. OGG to LAX 9-2-2018. Extra comfort seats are exactly what they promise - unlike other airlines that charge more for "Economy Plus" (say United) but really don't give any more. Hawaiian gives you honest extra leg room and the arm rest between the seats raises up for even more comfort. Our flight crew was professional but always friendly, the cabin clean, and with plenty of overhead bin space so no fighting with anyone for bag storage. Will never fly to/from Islands on airline other than Hawaiian. Wish they flew more Mainland routes. Would switch in a heart beat! Flew on a HNL-SFO flight. Average legroom, very wide seat! Good padding, not a bad option for Domestic or INTL economy flights. Two windows as well at this seat. AKL-HNL in 11J. Great seat because it is so private. Full recline, however no underseat storage during takeoff and landing. Heaps of legroom. Far enough in front of lavs. Only major downside is that slight noise and light pollution comes from the galley by Door 2. 11H&11J are great seats. Bulkhead but lots of legroom. Lots of overhead space. Get to deplane before rows 14+. Seats fully recline even with oxygen tanks behind seats. Seats 11A&B also good seats. 11C&G have your legs into aisle leading into First cabin; people walking buy may hit your legs. First class seats are uncomfortable in all positions. Foot rest is terrible - not even room for one of my female feet. Awkward design. Lie flat position would be better if it wasn't for the problematic foot rest. Unfortunately food was bad both coming and going. With the seat pad for sleeping, this was a comfortable seat with aisle access. The recline dial was easy to use. The foot rest is narrow. The privacy panel didn't really block the light from my neighbor's I-pad while he was watching videos and I was trying (unsuccessfully) to sleep. Never can on a plane. 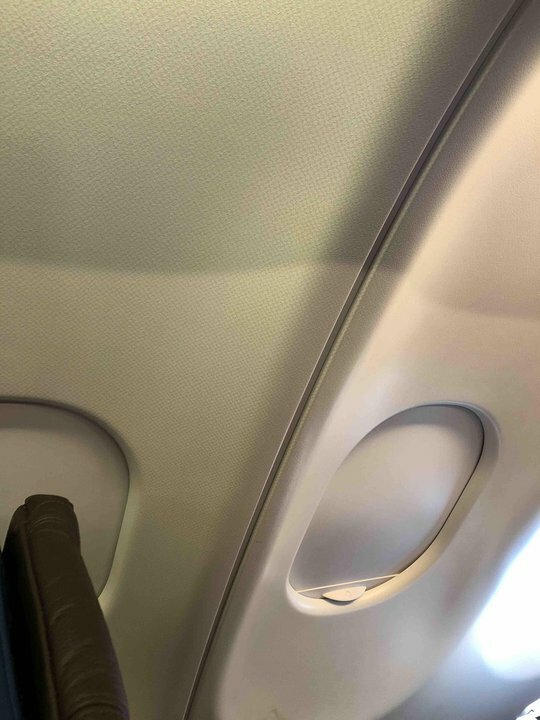 The window seat is quite off. Window is NOT aligned properly. More like a window wall seat if you will. The window is more towards the back of the seat (16A). Extra Comfort but sadly no window view. 28H and 28J did not recline however the seats in row 27 did leaving very little room between the 27H seat back and my face. Comfortable window seat. Needed flight attendant to explain console in the middle with the movies. Weird to be at an angle in the plane, used to feet forward. Roomy for 5'4" me, hard for 6'3" husband in 2B. Great for 10 a.m. flight going to HNL, not so good for seats going back on other side, H & J. Very dark, hard to read books. Service very good. Food great going, not so good coming home. Beware rows 11 & 12, extra price but very cramped and no lean back. Young skinny people only. ABHJ seats in first have more legroom since there is a small area in front of the footrest for AJ to exit if BH are in lie-flat mode. CG have the same footrests but they are flush with the casing of the seat in front of them since both seats have direct aisle access. Seats 11H and 11J do not recline. There is a bulkhead in front and a wall in back so nobody nearby except across the aisle, but because of the equipment stored behind the seats they do not recline. I'm pretty sure 11A and 11B do not recline either. The middle seats in row 11 do recline. There are two windows in row 11. OGG to LAX. Very disappointing new first class. Not really a flat bed, more like a foot rest with a sliding seat. New Ipad entertainment was lousy with limited movies, tv and no Hawaiian music. They would only let you use it for a short time and took away 45 minutes before landing. Food was a joke, appetizer consisted of 3 small shrimp with kimchee essence, supposed to be spicy udon noodle instead had bland marinara sauce. No vegetables, no salad. Wine was also a step down from United, American or Delta. Not sure what has happened to the old Hawaiian air Aloha Spirit. Flew on this flight from HNL to SAN. Can't say enough about how nice it was to fly in this new configuration. For us if was more than comfortable. The ability to utilize the lie flat seats was awesome. More than enough room to move around. Each of us were provided with the iPad pro (12") for watching movies. Food was excellent and the flight attendants were top notch. Can't say enough about the flight. Comfortable seat, not too narrow, reasonable leg room, and everybody in coach got FREE blankets and pillows for the overnight flight! Hawaiian Airlines, you rule!!! And for those that have complaints about first class I suggest you try United's coach service on their very cramped 737's back to the mainland, you will be humbled. Seats 15H/15J in extra comfort although possibly worth the extra $165 the in flight entainment is touch screen and as my wife found out the person in the seat behind was constantly hitting his screen. Extra comfort does not mean extra quiet. Beware of the babies and young children, good grief!!! These two seats were "extra comfort" class and offered ample leg room. The only negative is the bright lights in the service corridor where the restrooms were and where crew organized meals. The lights were do bright and shown directly down toe isle towards the seats along the right side (h and j seats) that it was difficult the doze off of sleep. new seats with no information on how to operate them. We needed to call attendant for that. I just wanted to lean back but couldn't unless I went forward first and foot rest - NOT good. we couldn't get the tray nor screen to pop up even using two hands. Had to get flight attendant to help in both incidents with that as well. Not my favorite 1st class experience. Very quiet area, hardly any noise from FA station and no noise from bathroom. Enough leg room and seat recline for someone under 70" tall. Had this seat from HND - HNL. Great seat and service on HA. Lunch wasn't bad and the IFE was decent. The bathroom isn't a big issue being close to the seat. Their A330 is a great choice for SFO to OGG. The new first class seats are really comfortable and spacious. Props to Hawaiian for making the best domestic first class hard product! I will no longer fly any other carrier to Hawaii, period! My husband and I recently flew on this plane for our trip to Hawaii. My seat did recline however on the trip over to Hawaii my little video screen did not stay up to use it. The mechanism that holds it up was broken. On the way back home we flew on the same Airbus 330 style of plane but this time my video player worked fine but my husbands video wouldn't work at first. While we enjoyed the privacy of this little nook with only 2 seats we felt the seats were too narrow and we fought elbows all the way over and back. Next time we will break the bank and fly first class. Will try 34 AB or HJ next time. Friends loved those seats and said seats fully reclined. New HA business class configuration is poor, especially in middle (C&G) seats as foot room is very narrow and uncomfortable in all positions. Seats are stiff and uncomfortable in upright position My seat was broken and did not 'complete' the flat bed position Possibly the worst flat bed business class seat I have had the displeasure of experiencing. Very disappointing. The seats 3c and 3g have less leg room! The footrest is much smaller than for all other seats so one with far above 6 feet can not make full use out of them (no space for two legs)! Seat 11J, although extra comfort is claustrophobic. A bulkhead wall in front of you and one behind, make it tight. Also, this seat did not recline at all. Hawaiian 1 LAX-HNL March 12. Avoid this seat. Hawaiian Airlines flies 1 versions of Airbus A330-200 (332).